Discussion in 'iPhone and iPad Games' started by Phoebius, Dec 14, 2016. Special launch discount! The game is 1,99$ during the first weeks! 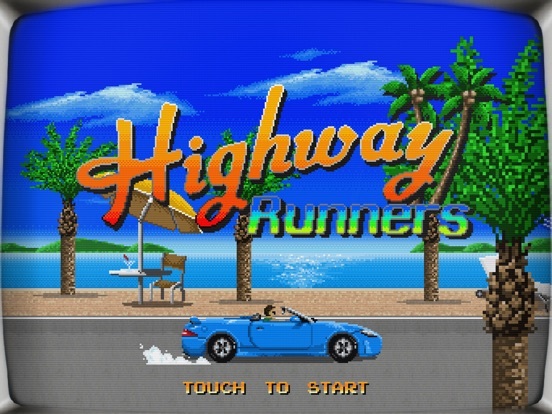 Highway Runners is a retro-inspired racing game for iOS, aiming to provide players the same sense of freedom the 16-bits oldschool arcade games did. Will you be good enough to get to the finish line? 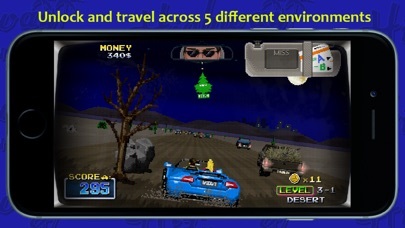 • Aim for the high score by grazing cars! The game is totally free from in-app purchases : unlock everything with the cash earned in the game! 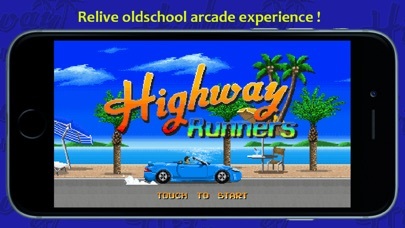 Highway Runners is a retro-inspired racing game for iOS, aiming to provide players the same sense of freedom the 16-bits oldschool arcade games did. Will you be good enough to get to the finish line? 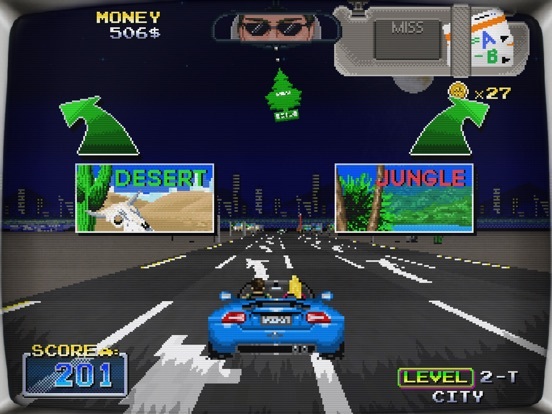 Features : • Old-school 16-bit graphics • 15 levels in 5 different environments (2 unlockable) • Collect money in game to unlock pendants and change your game style • Aim for the high score by grazing cars! 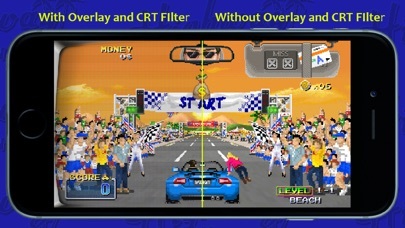 • CRT and Overlay filters • Play by day, evening, and night • Accelerometer intuitive gameplay OR classic touch gameplay The game is totally free from in-app purchases : unlock everything with the cash earned in the game! Love these sorts of racer, so might have to give it ago. Any idea on the controls on this? The description seems to indicate tilt controls circa-2009 which means I will tilt myself directly out of this thread. Maybe instead of being snarky about it you could simply request the option for non-tilt controls like a normal human being? 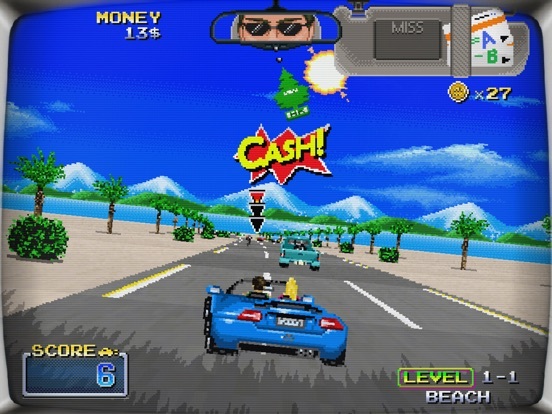 This is a SERIOUSLY great homage to OutRun. The basic point-to-point style of racing is solid, but the little details like the different rear view mirror trinkets that offer bonuses and the ability to race during different times of day set this apart. 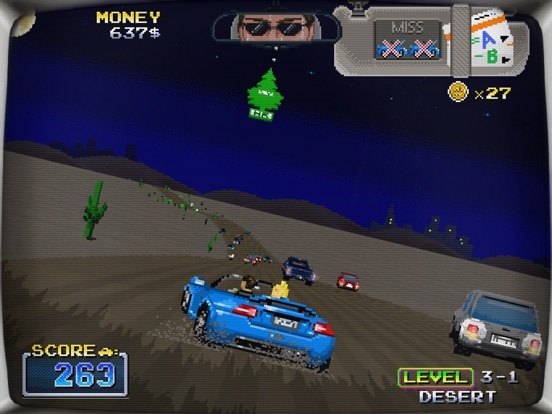 I especially love the destructible elements in the environment and the coins that you can collect which give you something to do other than just race and avoid other vehicles. Some of the coin lines even lead you right into taking out a crowd of people lined up along the track. Brutal! The scanlines and faux monitor overlay are also charming touches, but can thankfully be turned off for a cleaner look. Oh! Also the whole grazing other cars thing is really a brilliant addition. About the controls: Yes there is only tilt. It works great for the most part, but doesn't offer enough precision for me to properly graze other vehicles. Not a deal breaker for me but I'd love the inclusion of a virtual button option. 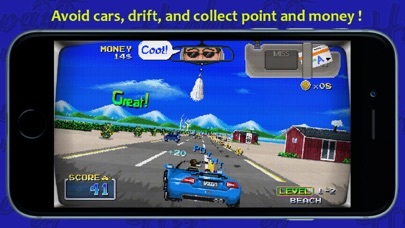 I'd look to Horizon Chase or Final Freeway for examples of good OutRun-alikes with touch control options. No touch control, no buy. I only have an IPad,but i couldn't resist this. Would also like to see touch controls as an option,but it's not a biggie for me.Would also like to see IPad support. This was a pleasent surprise. I'm Steeven, one of the two guys behind Highway Runners. I understand your concerns about the gyro gameplay and take that into consideration for a future update of the game, if it's a big problem for the majority. 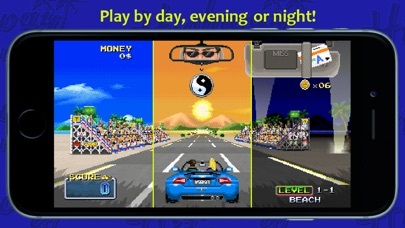 The video doesn't make the game justice, as you have to feel the gameplay in your hand to understand : the screen and Hud are moving as you tilt the iPhone, so you always watch the horizon at the right angle. Think "Truckers Delight", for example. Anyway, I'll give the feedback to my partner. It is possible to leave feedback about this game without insulting the developers. This is the only warning I'll give for people to keep their posts civil. I'm just downloading this now to support the developer, I'd like to request touch controls too if you can do it would be great, but I'm happy to use tilt controls. This and Mario are the only two games I bought this week. J’ai adoré le look du jeu. Je vais perdre la tête et acheter le jeu ce Noël. le prix va se maitenir de cette façon, ou tu vas changer par 99 cents ? Merci. Any plans to make this universal? I play mostly on my iPad mini. I, also, would pick this up in a heartbeat if it had touch controls; I'm not saying I ABSOLUTELY won't if they're not added, but... it makes the purchase much less tempting. With that said, you say the video doesn't do the game justice, but even the video looks AMAZING. Clearly a labor of love -- and I love that. I took the plunge to support the Dev even though I'm not a fan of tilt controls. The controls work very well and if your happy with tilt then no issues there. I like the general aesthetic, it's very well done and does look good with the screen tilting. Gameplay - it's what you think it's going to be, a well done Outrun style clone - I found it to be a fair bit easier than outrun - and it feels a bit slow to me, and I wasn't sure if it was speeding up as I went along. The only thing that I'm really struggling with is it's way way too pixellated for me - but I'm not sure if that's because I'm playing on the iPad and it isn't universal. 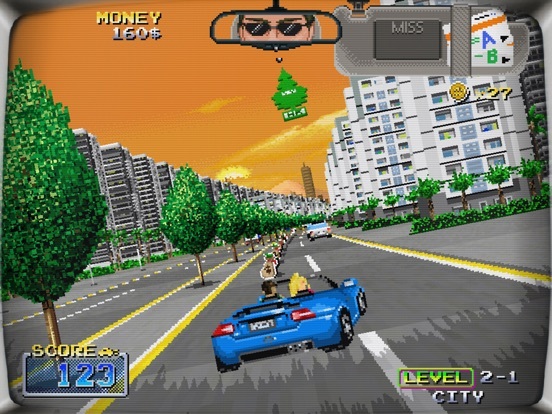 If there were touch controls and it was universal I suspect I'd play a lot of this - but as it is if you've got a phone and don't mind tilt controls then it's a smart little outrun clone with a nice retro look and feel to it. EDIT: the more I play it the more I'm enjoying the actual gameplay itself - just wishing more it was less pixelly and had touch controls!